…..G$$R are you talking about?! 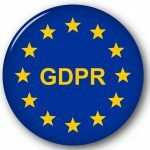 A talking point gripping the nation this week has been the delightful updated EU data protection regulation GDPR (General Data Protection Regulation) effective from May 25th. I’ve heard moans, groans and I’ve even witnessed some pretty irate peeps out there alongside the nearly constant ping of my email in-box. But quite honestly, dare I say it?…..I think it’s a good thing. There, I said it out loud for all to hear! How many times have you had emails or newsletters from companies that you don’t ever recall subscribing to? Annoying Spam that doesn’t make it automatically to your junk mail box? Had those moments where you suspect your personal data has been passed on without your permission? And tipping it on its head – as a business owner – are you confident that the data you hold on your clients is stored safely and securely? Are you clear about the purpose of holding it and what you will use it for? And have you been meaning to do a CRM system spring clean for ages to reconnect with clients but not quite got round to it? Well, GDPR has prompted all these questions (and more) to be asked. And forced actions to make sure that data is dealt with safely and respectfully and with the consent of the subjects you hold data on. And do you know what? In all the responses I’ve had so far (and there’s been a lot I’m pleased to say) not one has complained or moaned at me for making contact. Not one has suggested I’ve wasted their time. And not one has questioned my need to ask permission for keeping their very basic contact details on file to help me stay in touch. And do you know what else? Yup, you guessed it, there was even a handful of replies that said “glad you made contact, I’ve a job coming up that you’d be perfect for!” or words similar to that (they didn’t all say the same word for word obviously – as that would be weird!). So, in short as a customer see it as an opportunity to ignore all those opt-ins that you no longer want contact with. It’s a win-win in my book! Thank you to all my clients that so speedily responded with an ‘I’m in’ it is truly appreciated. And if any freelancers out there would welcome a chat about it, just give me a shout. p.s. Top tip: don’t forget to sort your system out too so that you always ask permission of new clients to be added to your database!